The Nvidia RTX 2060 is here, represents the best-value RTX GPU available right now, though the new GTX 1660 Ti has now appeared with its stripped-back Turing silicon giving mainstream gamers an alternative. Despite the team GeForce throwing analysts and journos off the scent with its “too much mainstream inventory” schtick a few months back, this is about as mainstream as the 20-series goes, leaving the bizarrely named 16-series chips to cater to the real volume market. While lacking the GTX 1060’s more budget-conscious price tag, this card joins the RTX 20-series pack as the most budget-friendly SKU going. And retains enough specialised silicon to grant users entry into this fresh, ray-traced future. And that’s ostensibly what separates it from the GTX 1660 Ti. Just about. With only five Giga Rays per second of RT Core performance residing in the Turing GPU at its core, the RTX 2060 scrapes the absolute minimum rated spec for real-time ray tracing. But with just two games in the DXR arsenal, Nvidia can’t rest on newfangled features alone to sell its latest card. No, if it’s to sway swathes of gamers like its Pascal predecessor, it still needs to have the rasterized gaming chops to appeal to the masses. But that shouldn’t be too much of an issue thanks to the cut-down TU106 GPU torn right out from a poor, unsuspecting RTX 2070. With 50% more CUDA Cores than the GTX 1060, this fifth-tier card (including the Titan RTX) has more than enough firepower to make a name for itself, ostensibly taking the reins from the GTX 1070 in its price/performance bracket. 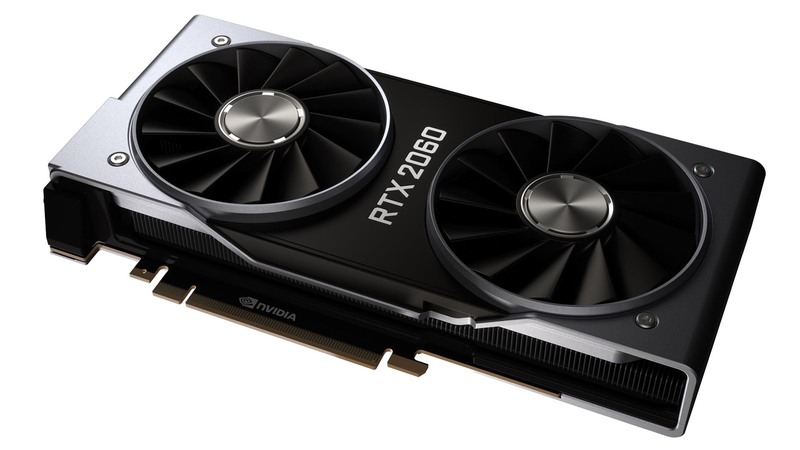 The RTX 2060 was announced over at CES on January 7 by Nvidia’s leather-clad leader, Jen-Hsun Huang. The stock clockspeed Founders Edition card is suited, booted, and available worldwide, to be accompanied by board partners’ own stock and factory overclocked designs. You need to be able to throw around roughly five billion rays per second for entry-level real-time ray tracing. And to hit that magic number and let gamers ascend unto Mt. Olympus, Nvidia has had to retain 30 SMs worth of ray tracing silicon from the full-fat TU106 GPU. That amounts to 1,920 CUDA Cores, 30 RT Cores, and 240 Tensor Cores. That’s only 20% CUDAs shy of the RTX 2070’s unfettered total, and a 50% increase in core count over the GTX 1060 from days past. All that sweet, silky silicon resides within a mammoth 445mm2 GPU, kept chilly by a stubby, yet oddly endearing, mini-me of the twin axial shroud cooler. The same one found across all 20-series Founder’s Edition cards. Yet the RTX 2060’s shroud needn’t be quite so beefy. It will be the first 20-series Founder’s Edition graphics card that doesn’t come pre-overclocked from the factory. While the rest of Nvidia’s own-brand GeForce RTX cards offer a moderate overclock, the green team has played it safe with a 1,680MHz GPU boost clock for the TU106 GPU in the RTX 2060. Despite reports of a multitude of memory configurations incoming for the RTX 2060, we know of only one. With 6GB of GDDR6 running at 14Gbps across an aggregate 192-bit bus, the resulting 336GB/sec bandwidth should be more than enough to keep that GPU well-fed. As for power draw, the card is rated to a TDP spec of 160W, considerably more than the GTX 1060 and only 15W shy of the fully-fledged RTX 2070’s wattage. With a minimal trim to the mammoth 445mm2 TU106 GPU within, that’s none too surprising. That is also slightly higher than the TDP of the CUDA-equivalent GTX 1070. Of course, if all that wasn’t enough indication that this isn’t a straight swap for the bang for your buck GTX 1060, then the price will be. The RTX 2060 Founders Edition retails for $349, a whole $100 more than the GTX 1060. All told, the RTX 2060 royally trounces the GTX 1070. So it’s already on par with the relative performance of its fellow Turing cards. But where the other RTX 20-series GPUs stop there, the RTX 2060 still has more to offer, equaling the performance of the GTX 1070 Ti in many titles, too. The RTX 2060 ends up holding a 12% performance gain over the GTX 1070 across an average of all runs, and performance on equal standing with the GTX 1070 Ti. 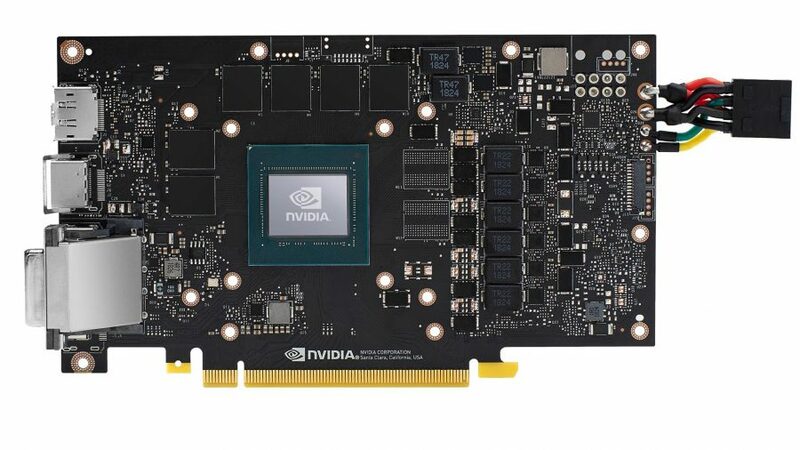 This marks the first time a Turing card jumps two tiers over the Pascal generation, even if one is the intermediary GTX 1070 Ti and not quite a fully-fledged GPU milestone. That’s no small feat, either. The GTX 1070 Ti is essentially a moderately hampered GTX 1080, and the RTX 2060 manages to just about keep up with all of its 2,432 CUDA Cores across 1080p, 1440p, and even teeters close at 4K. The speedier memory and extra SM of the GTX 1080 does allow that card to just keep out of reach of the young upstart, however. But at least some of this ground can be covered by overclocking your chip. Sure, statistics (which I may or may not be pulling from thin air, but I’m sure I saw it somewhere) would indicate that most of you won’t tweak the GPU clock on your shiny new card, but it’s worth noting there is a reasonable amount of free performance on the table. With the Founders Edition cooler managing a cool 64°C under pressure, there’s plenty of thermal headroom to play with if you want to push the clockspeeds further. Our card ran almost entirely stable with a 186MHz GPU offset from NVScanner alone, managing to gain roughly 5% greater average frames per second in Far Cry 5. There are a few outliers in our testing, however. Total War: Warhammer II, across an average of three runs, was particularly fussy at 1080p, leading to the RTX 2060 outperforming the RTX 2070. Let’s blame the drivers for that one. Similarly, Assassin’s Creed: Odyssey at 1080p managed equal standing to the RTX 2070, even pulling greater minimum fps. 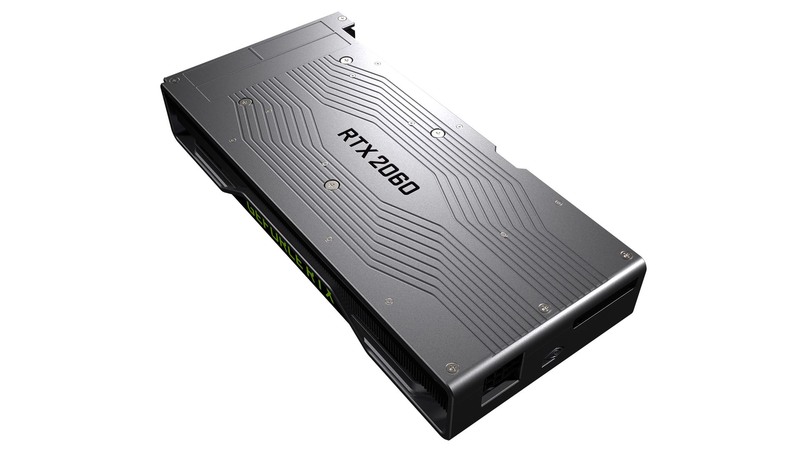 While these results will likely swing back towards the status quo during retesting, it does highlight the rather minimal truncation carried out on the TU106 GPU to take it down to RTX 2060 standing. But I know y’all are thirsty for those real-time ray tracing results, either to revel in it or to complain endlessly about. Hey, that’s your prerogative. We gave the RTX 2060 a trial by fire in our own Battlefield 5 Twisted Metal benchmark: a full server fly-by averaged across three runs. Won't settle for anything less than top performance? The RTX 2080 Ti is unmatched in the GPU world. Quick note: Battlefield 5 doesn’t offer any in-game benchmark, so be wary when comparing ray tracing results like for like. Across our comparatively intensive run we found the RTX 2060’s 30 RT Cores managed to get within eight frames of that magic 60fps at 1080p. Deep Learning Super Sampling (DLSS) will soon makes its way into the title, however, which will hopefully bump those figures in the right direction and hit that important performance milestone. The RTX 2060 isn’t really a mainstream card. Or at least it’s debatable. It isn’t the card that will compete in the volume segment against AMD’s mainstream graphics cards, that’s for sure. But it might be the best value Turing card of the lot so far, regardless. The Nvidia GTX 1070 Ti Founders Edition launched for $100 more than the $349 RTX 2060, yet we’re seeing awfully similar performance from the cheapest Turing for less than the price of the GTX 1070 at launch ($399/£379). That’s more than can be said for the other 20-series cards, at least. The RTX 2080 and RTX 2070 rely on the proposition of ray tracing and the RTX platform to justify the generational jump, lacking much in the way of tangible performance uplift in their respective price brackets. 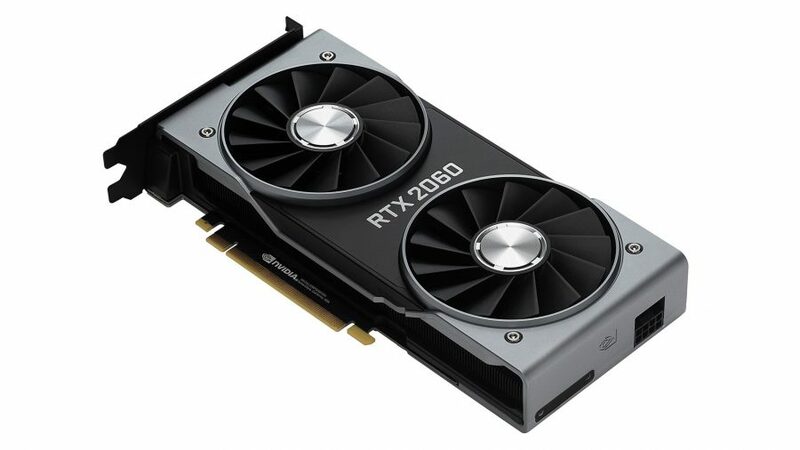 And while it may leave budget-conscious gamers unsure of where to go next, the RTX 2060, as seen as an enthusiast card, is a solid performer in its price bracket: ray tracing or no. But whether its RTX silicon will be worth it, or convincing, is yet to be proven. With a rather pitiful lineup of two games offering any semblance of utilisation for either the RT Cores or Tensor Cores, the RTX platform needs to gain some serious traction in 2019 to entice gamers on its value alone. 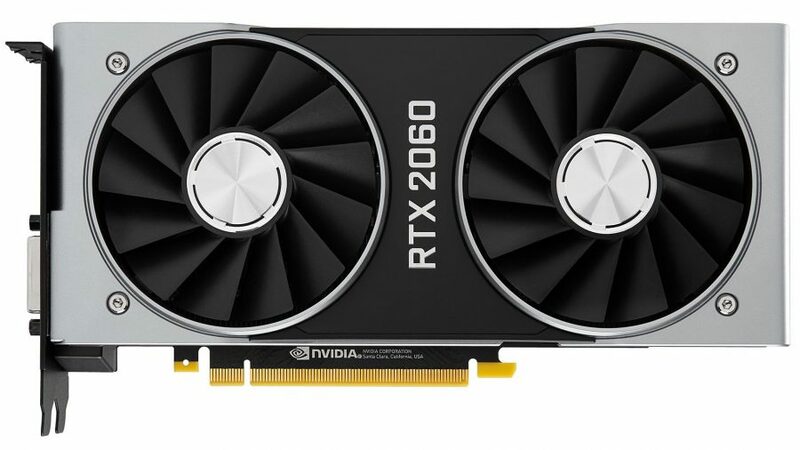 It may leave budget-conscious gamers in the dark, but with leapfrogging performance right now, and a promise of more to come in a ray traced world, the RTX 2060 is the best value card we're likely to ever see from Nvidia's 20-series generation.